Almost a year since groundbreaking, the east side is starting to take shape and almost reached final height. New 33,000-seater is will be ready in 2017. Updates available from now on thanks to City of Regina. Initially it was also expected to retain its traditional open layout, but along the 2012’s first renderings the stadium was envisaged as mostly enclosed, with at least partial cover. Final design was revealed on May 22, 2014 and construction followed on in mid-June. The stadium is being built in a sunken bowl accommodating lowest tier of seating. West, east and north stands will have additional upper tiers, while the south end will be topped only by a giant screen. Currently the east stand has nearly reached its final height already, while ground and foundation works are continued in other areas. So far, an estimated 230,000 cubic metres of dirt has been removed from the site. As well, 2,700 tons of reinforcing steel has been put in place. 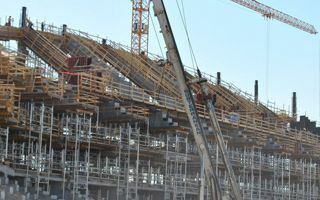 While the anchor tenant, Saskatchewan Roughriders, are expected to provide $25 million and the province grants further $80 million, it’s the city of Regina that will take up one of the largest expenses in its history. The city’s own resources are expected to be at $73 million, while a massive $100 million will come in a loan from the province. Overall the stadium is expected to cost $278 million (US$250m / €180m).